Escape to a world where contemporary design combines with natural elements to provide a unique cultural balance. This is E Hotel Spa & Resort Cyprus, a stylish and exciting eco-friendly hotel located in the secluded Cyprus suburb of Pervolia. Overlooking the beautiful white sands of Faros Beach, only eight miles from the airport, this stunning new hotel is the ideal destination for travellers looking for a traditional, picturesque Cypriot village. Discover luxury resort-style amenities and warm, friendly service at this modern and stylish hideaway overlooking the Mediterranean Sea. Free Wi-Fi, 32-inch Plasma HD TVs with satellite channels, custom design beds and a balcony with scenic views of the lush gardens are standard in all of E-Hotel Spa & Resort's luxurious rooms. Each is furnished with chic, modern furnishings. Guests can enjoy Mediterranean fusion cuisine in E-Hotel's a la carte restaurant, or on the outdoor terrace while watching the sunset. Sky Lounge Roof Bar, located atop the striking new E Hotel Spa & Resort Cyprus, offers stunning panoramic views of the Mediterranean Sea. An open, outdoor lounge with music, Sky Lounge is the newest and most exciting nightlife spot on Cyprus. 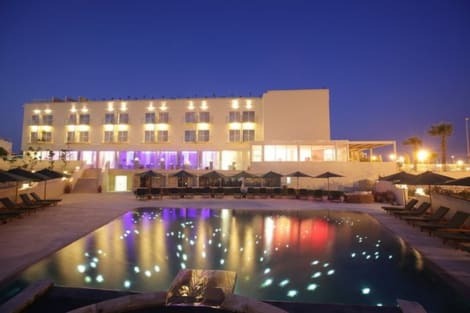 Larnaca Airport is just 8 km away from E-Hotel Spa & Resort. Free private parking is possible on site. Make yourself at home in one of the 10 individually furnished guestrooms, featuring kitchens with full-sized refrigerators/freezers and stovetops. Rooms have private balconies or patios. Complimentary wireless Internet access keeps you connected, and digital programming is available for your entertainment. Conveniences include separate sitting areas and coffee/tea makers, and you can also request microwaves. lastminute.com has a fantastic range of hotels in Pervolia, with everything from cheap hotels to luxurious five star accommodation available. We like to live up to our last minute name so remember you can book any one of our excellent Pervolia hotels up until midnight and stay the same night.